I have read a few of Angel/Nephilim books before, and I personally like most of them. Some of them were okay, some were a bit darker than the others, some were really good, but they were all quite different from each other. 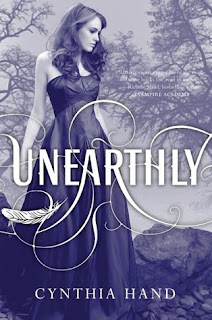 Unearthly by Cynthia Hand, thankfully, also separates itself from all the other angel books. Despite the fact that it also had a different taste from all other angel books, the first half of the story was a bit boring. It introduced the angel-bloods, their purpose, how they came to be, their characteristics. The book started with most of the explanations about the them. In my opinion, the beginning of the book was a bit weak. THANK YOU TUCKER AVERY FOR SAVING EVERYTHING! Tucker did not really stand out when he first appeared in book. But gosh, did he change my mind about wanting to stop reading! He was actually one of the major reasons I kept on reading. And thank heavens I did because the story was actually good. I like that the whole story was somehow driven my Clara's purpose, and not entirely by the romance. The cute love story was great as well. And the ending was nicely put up. It wasn't really a cliffhanger, but it will leave you wanting to read the next books (if you liked Unearthly).